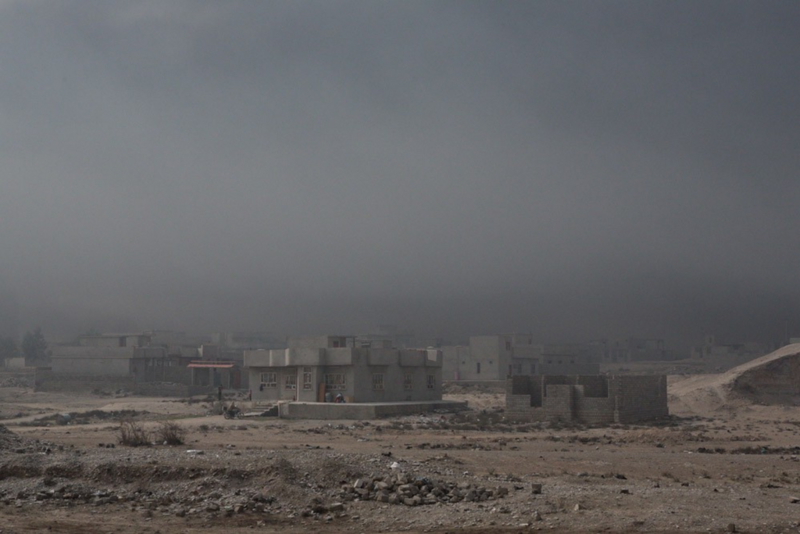 The sky over the Iraqi town of Qayyarah is dark and oppressive, and one could be forgiven for thinking it will rain at any moment. It’s so dark that cars drive down the town’s almost deserted streets with their headlights on. It feels like early evening, but in reality it’s just 1:00 p.m. on a Tuesday. The sun is shining a few miles away, but not here. 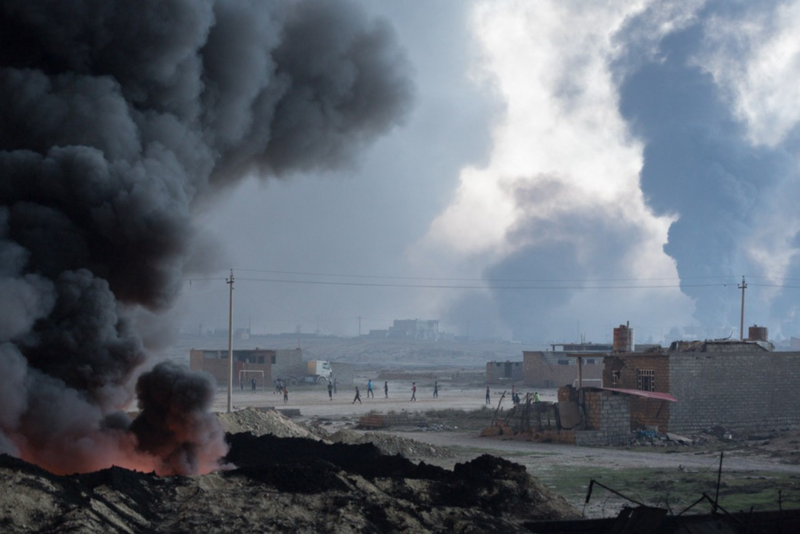 Smoke from burning oil facilities — set alight by Islamic State militants — is traveling straight through Qayyarah, reducing visibility and coating everything, including people, with greasy oil-laden soot and filling the air with an acrid smell. 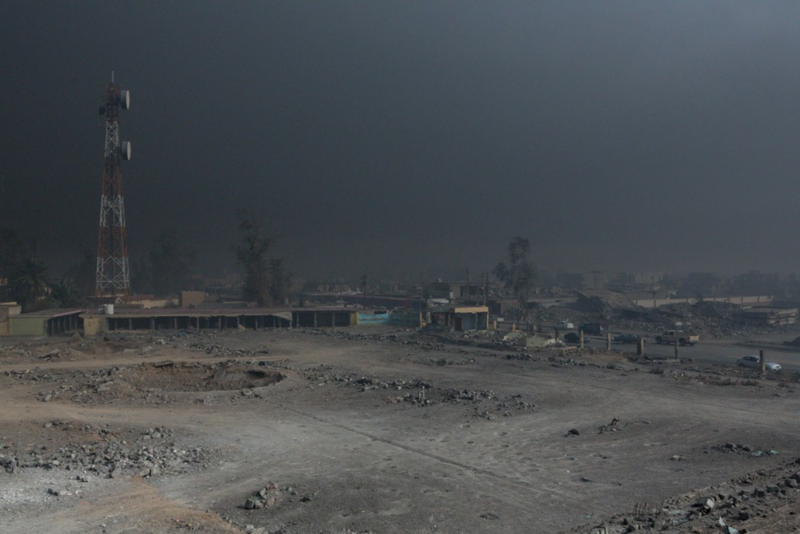 Every day is a bad day in Qayyarah, and today is a particularly bad one. The town is an environmental disaster zone. Qayyarah, with an estimated population of around 15,000 Sunni Muslims before the Islamic State invasion, sits next to the Tigris River around 30 miles to the south of Mosul. A nearby joint U.S. and Iraqi base provides artillery support for the ongoing Mosul offensive. To the southwest is the Jad’ah internally displaced persons camp — one of several camps in Iraq housing those who have either escaped the Islamic State, or are trying to get away from the fighting between militants and the Iraqi Security Forces. 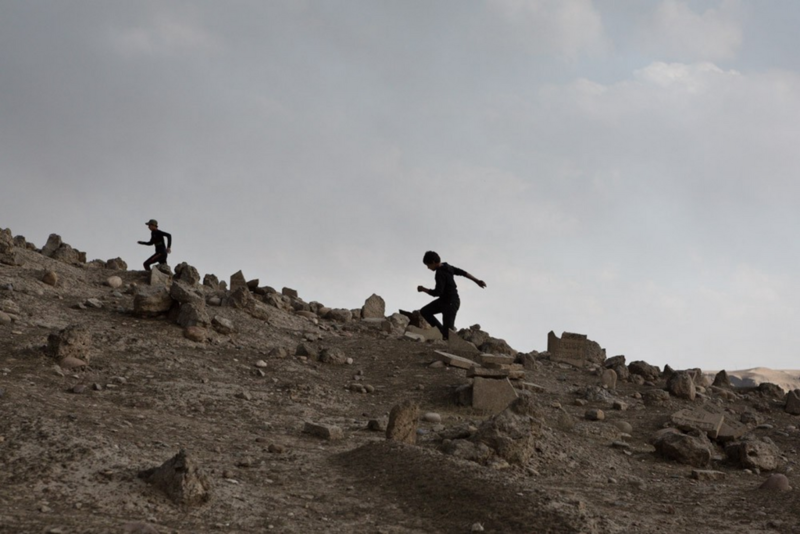 There are fewer boys aged 14-18 at the Jad’ah camp than there should be, indicating the possibility that the Islamic State forced children in the area to fight, according to an October 2016 report from the U.N. Office for the Coordination of Humanitarian Affairs. A constant stream of refugees pass through the town as the Iraqi military pushes north toward Mosul. Just outside the town to the northwest is the Qayyarah oil field which once produced around an estimated 10,000 barrels of crude oil per day — or around 315,000 U.S. gallons — before the Islamic State swept into the area in June 2014. 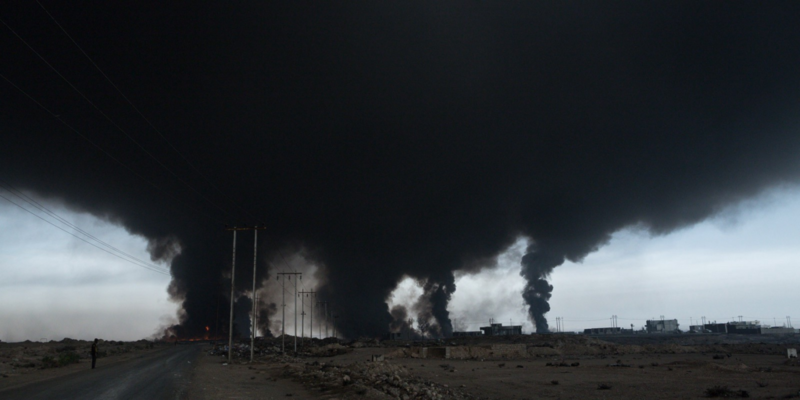 Due to its proximity to the oil field, the town also has a refinery within its boundaries, and pipes and valves pass through Qayyarah’s residential areas. Before Iraqi troops liberated the area, the oil fields were one of several places in Iraq and Syria where the Islamic State took oil to finance its activities. Iraqi troops seized Qayyarah on Aug. 25, 2016, after an operation that began in July. 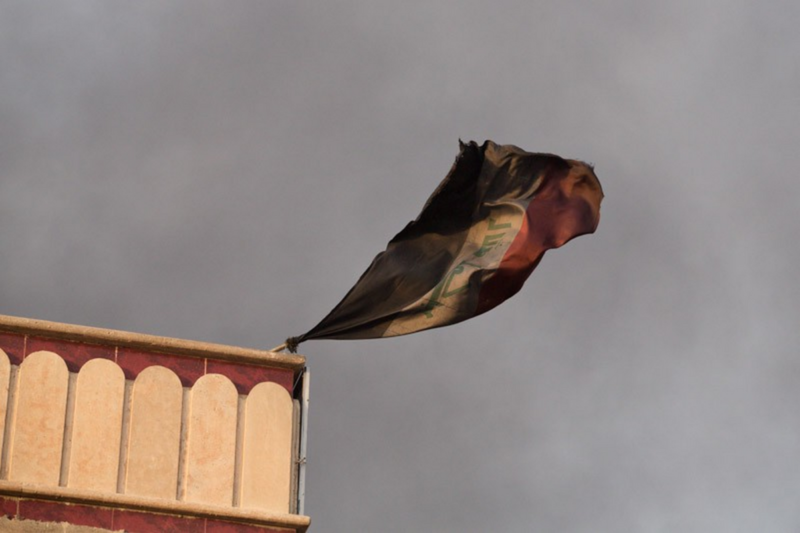 The town was one of the ISF’s first objectives in the offensive to retake Mosul, Iraq’s second largest city and the biggest city under Islamic State occupation. 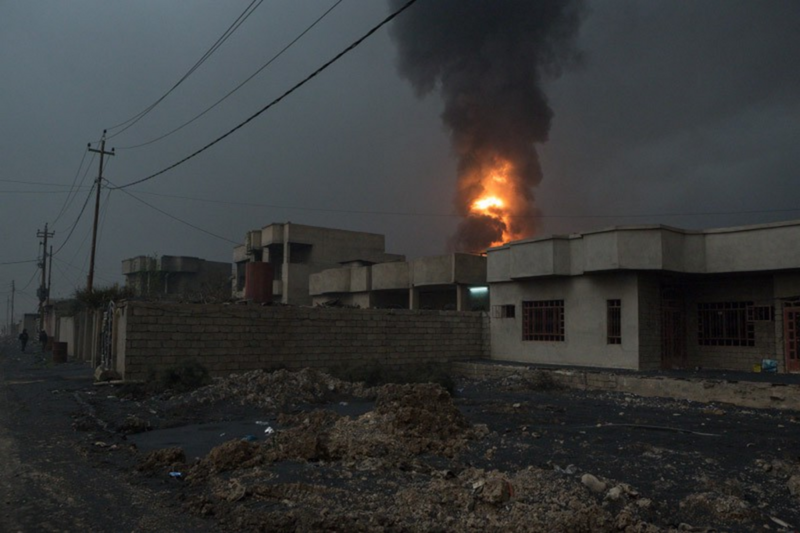 In either June or July — reports differ — the Islamic State set the the town’s oil wells and facilities on fire as Iraqi troops approached. In November 2016, some three months later, they are still burning. 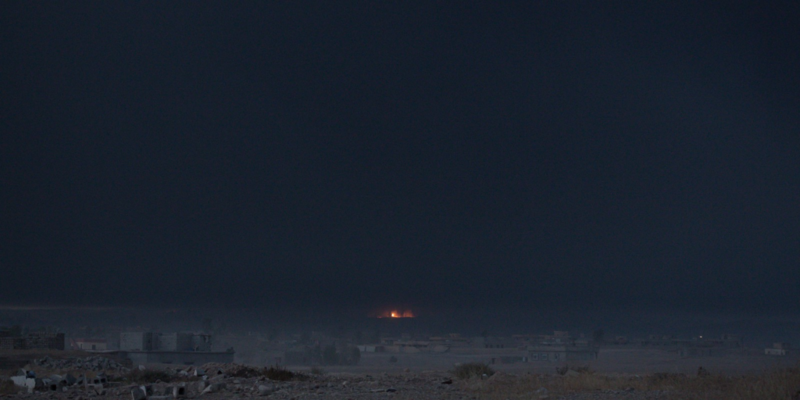 The Islamic State also set a sulphur plant near Qayyarah on fire. That plant burned for several days. 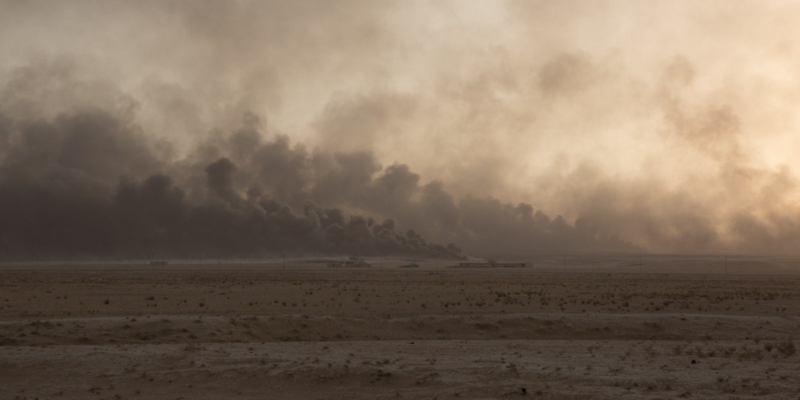 Setting light to the oil facilities gave the Islamic State a twofold victory. 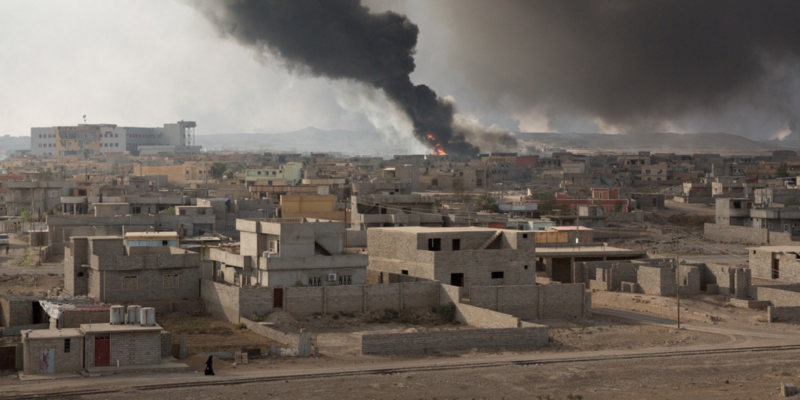 On a tactical level, it gave militants in the area a huge smokescreen to provide cover from coalition and Iraqi military surveillance and air strikes. Secondly, it denied the Iraqi government use of the oil fields — a strategy repeated throughout the ages and conjuring scenes reminiscent of the first Gulf War in 1991, when the Iraqi military set Kuwaiti oil wells ablaze ahead of advancing troops. The Iraqi government is not looking to resume oil production here until after Mosul falls, according to Reuters. That might not for another one to six months. For the residents of Qayyarah, all of this is academic. For them, the fact is they must make it through with their days under the clouds of the thick acrid smoke which dominates life in the town. 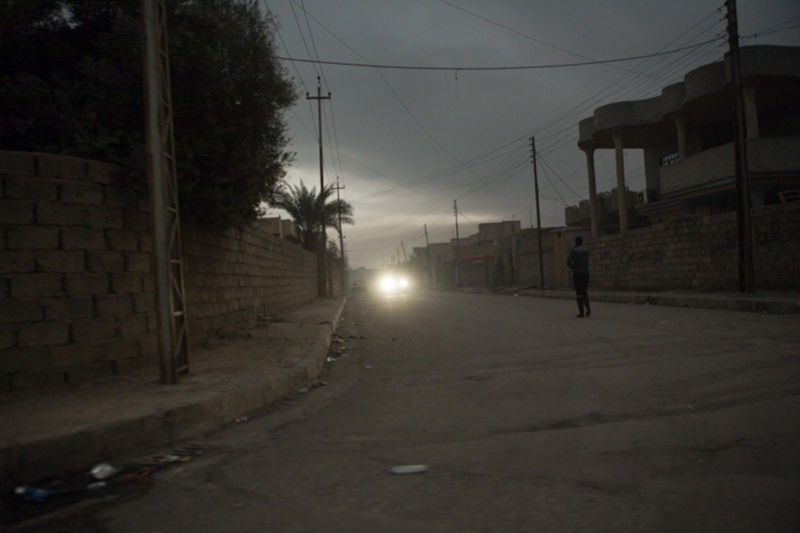 In the gloomy light that filters through the smoke, a car bounces down a mostly deserted road on the western edge of Qayyarah. Vehicles stop at occasional ad-hoc checkpoints, one of which has unexploded ordnance set up as markers to separate traffic. The houses next to the road bear the signs of fighting. Some are lucky and are only pockmarked by bullet holes, but others have taken hits from Iraqi tanks or been reduced to rubble after being targeted by air strikes. There would have been more damage, but one Iraqi officer said the town was taken quickly. 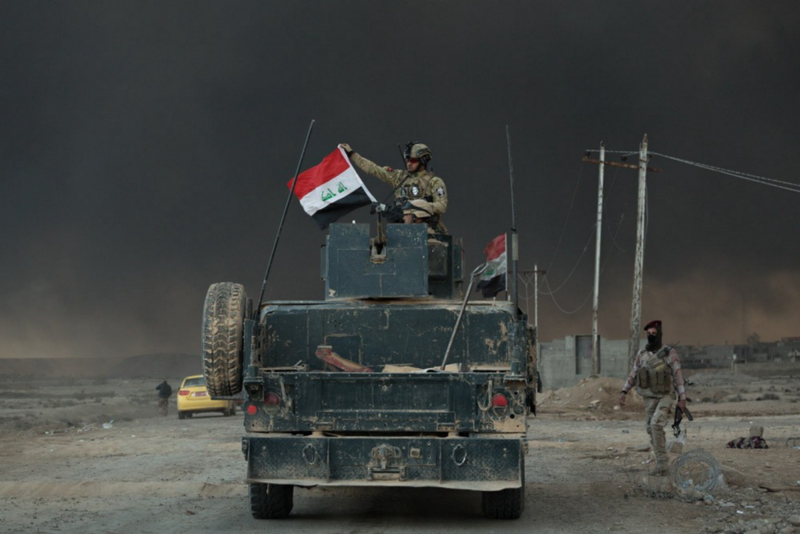 Despite its importance for the Islamic State, the Iraqi troops caught the militants by surprise. Reports suggest that the Islamic State didn’t employ many improvised explosive devices in the town, although the day before my visit a cow was killed after detonating an IED. 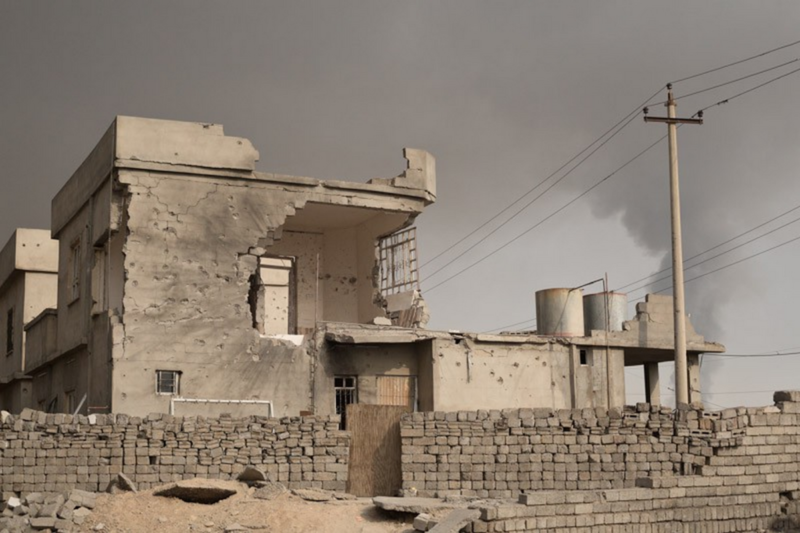 Nearby towns such as Al Shora, to the north of Qayyarah, were more heavily booby-trapped and will require a lot of work to remove the IEDs so residents can return safely. Like an upside-down funnel, smoke in the distance billows upward before spreading out to fill the sky with a thick, dark blanket of dirty smoke, joining with clouds that originate from the burning wells beyond the town. To the northwest of Qayyarah a large patch of land burns, but it’s hard to see what was set alight because of the damage. 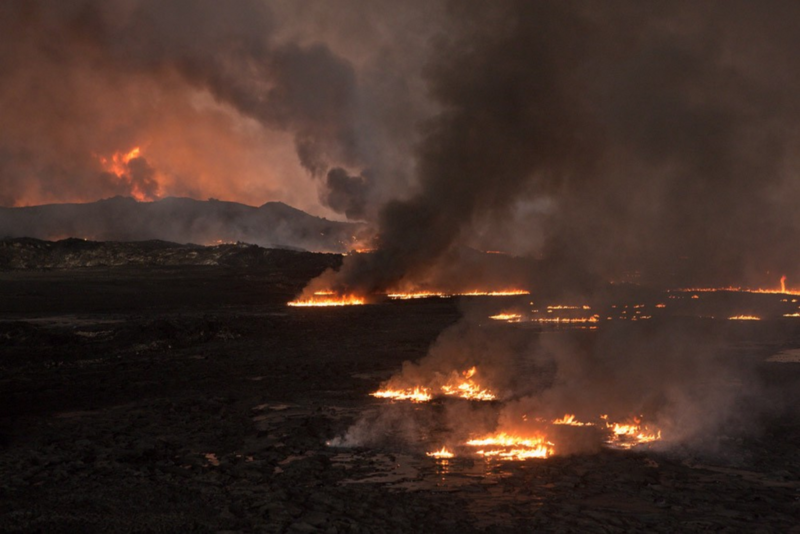 The blaze covers a huge area of at least 200 meters in length. Closer to the flames, the heat builds and the ground becomes uniformly black — covered by a coating of residue which has built up over many weeks and crunches underfoot. 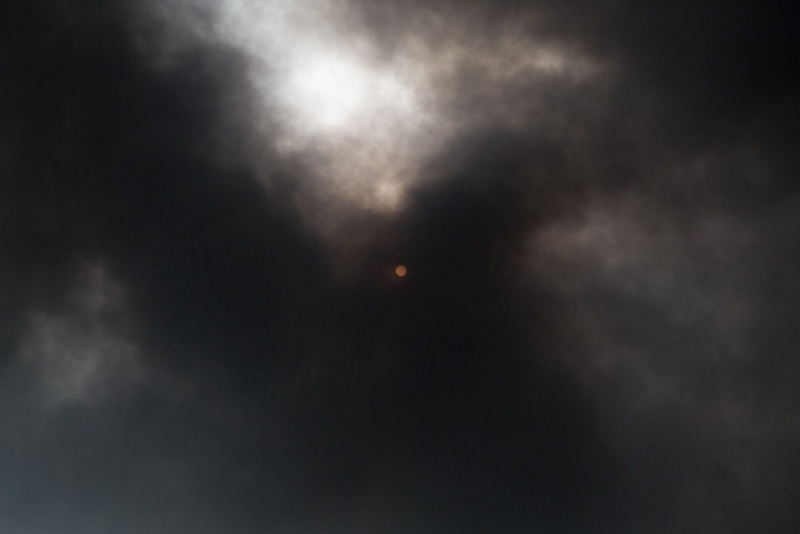 The smoke rises before being blown directly over the town, blotting out the sun and rendering it as a mere dull spot. Beneath the cloud the temperature is noticeably lower, and locals wear jackets despite it being unseasonably warm in the rest of northern Iraq. Buildings close to the fire have not escaped. What was once gray concrete is now dark from soot and spattered with unburnt oil. 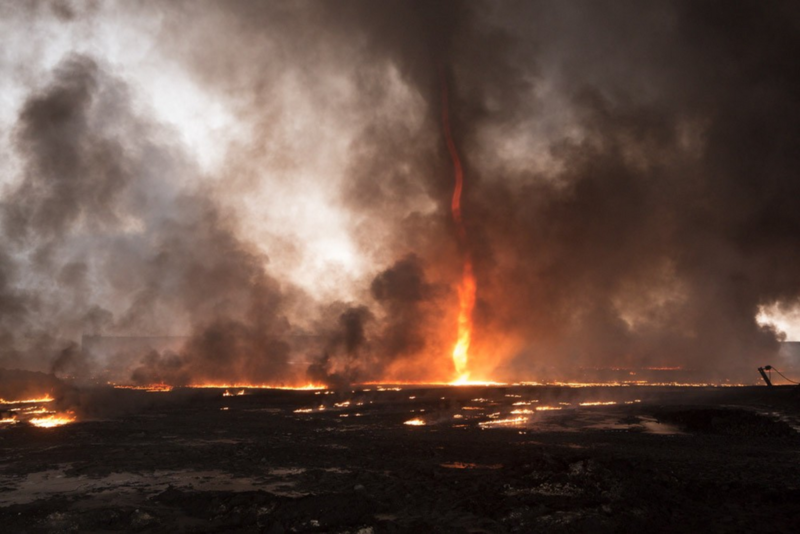 The oil seems to come out of the ground under extreme pressure in some places and at one point, a thin, tall flaming tornado forms within the flames with a roaring hiss. “We left three days before the Iraqi army arrived. ISIS came and broke the windows on the house. They used it to fight from,” says Mohammed, a local resident repairing the damage caused by a tank shell to his home during the town’s liberation. Mohammed adds that, for now at least, he and his family live elsewhere in Qayyarah with relatives. 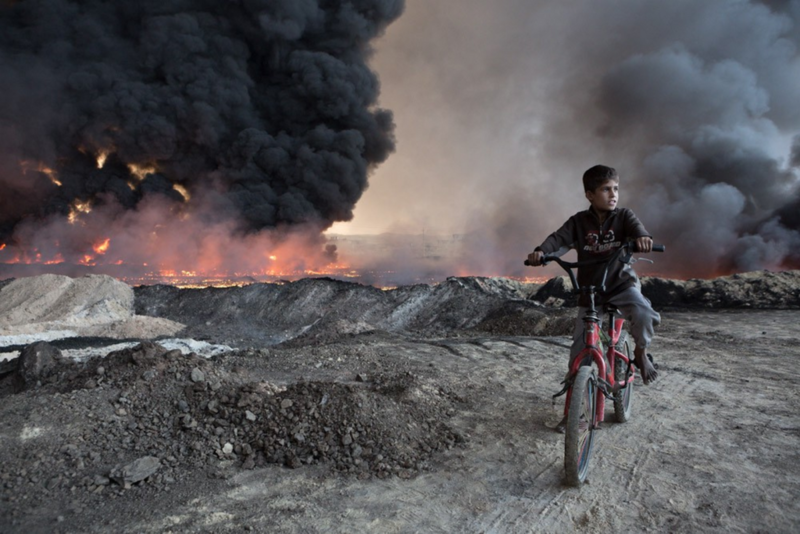 Mohammed is skeptical that the Iraqi government will put out the fires quickly. Mohammed points to construction machines that were moving during a visit by the North Oil managers, but which now stand stationary behind a sandy berm next to the fires. 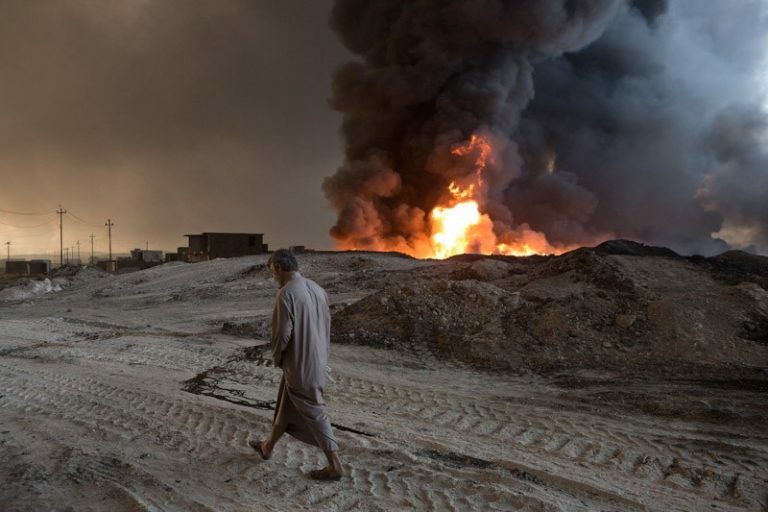 The director of North Oil, an Iraqi state-run company, speaking to the oil industry publication Iraq Oil Report, said that putting out the fires is a time consuming process. Mohammed’s frustration, however, is understandable. Mohammed mentions that setting light to the oil wells was not the only thing the militants did before the Iraqi Security Forces arrived. Mohammed thinks that at least 300 people from the surrounding villages are buried in Hammam Al Alil, where an estimated 500 bodies have already been found. 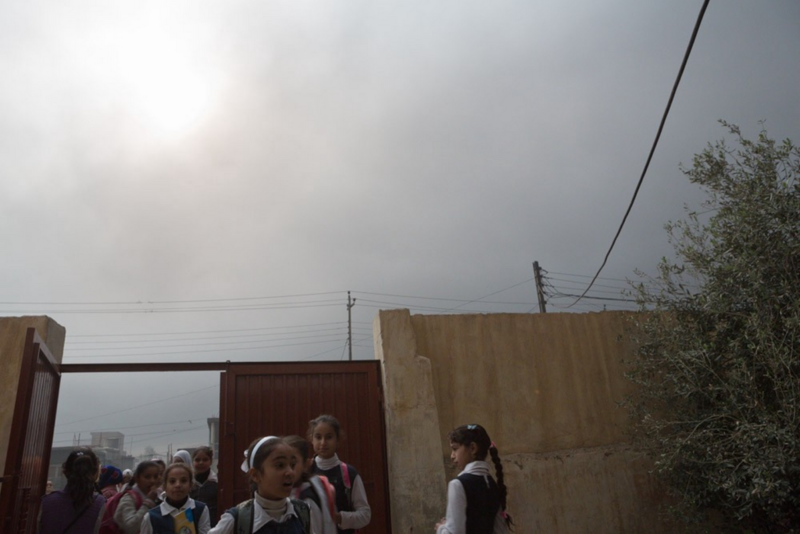 Elsewhere in Qayyarah, girls at the Al Rumana School prepare for an afternoon of study under the grey cloud of oil smoke. Life is difficult for the teachers here. They have 375 first-year students who are due to begin classes, but the necessary tutors are in refugee camps, and the schoolbooks are currently missing. All of the teachers look exhausted. Keeping several hundred children clean is a challenge for the teachers. Another teacher points out that everyone here, including the teachers, has dirty hands. “The smoke has a lot of dirt in it — it gets on everything. Even the food we cook is contaminated,” she adds before explaining that cleaning is hampered by the fact that the water and power supply to the town have not worked properly in some time. “The water is hardly on in the neighborhood. We have had some at the school, but it has oil in it,” says an older teacher. At the moment, everyone here is able to shower just once a week. The teachers all voice agreement when one questions how their current situation is possible. They see Iraq as a rich country and cannot understand how the fires have not yet been put out. “What of our children, they are losing their future,” the teacher says, shaking her head and wiping a tear from the corner of her eye as she starts to cry. Although short-term effects of smoke inhalation include coughing, irritation of the eyes, nose and throat and shortness of breath, the long-term effects of living in such a polluted environment are not fully known. The pollution will most likely affect the young, elderly and those with existing breathing conditions such as asthma. The closest proxy for the situation Qayyarah is the 1991 Kuwait oil fires, which the U.S. Department of Veterans Affairs studied given U.S. troops’ exposure. Among the chemicals released by those fires — carbon dioxide, carbon monoxide, sulpur oxide, nitrogen oxides, volatile organic hydrocarbons, hydrogen sulphide, and acidic gases. Winter in Northern Iraq involves a lot of rain which will further contaminate the land beneath the clouds, adding another facet to what is an environmental catastrophe. Not far from the school, a huge jet of flame roars from a burning oil valve within the town. 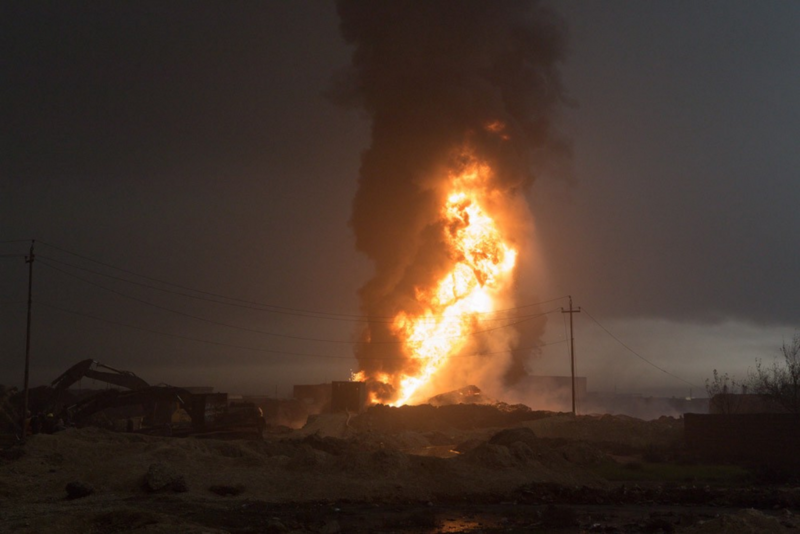 The valve once controlled oil flowing through a pipeline leading to the town’s processing plant, and was destroyed by the militants with an explosive device. 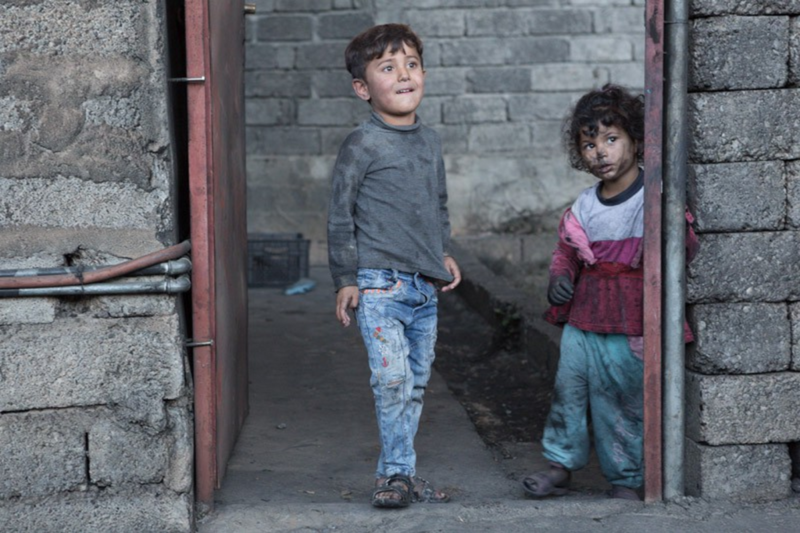 The Islamic State gave no warning to the civilians who live in houses just a few meters away. Groups of oil-smeared children laugh and play near the fire. There is little else for them to do in the town. Thing that can get the dirt off is either petrol or solvents, according to Abdul, neither of which are particularly good for anyone’s health. He points out that nights are the worst time, when there is no escape from the smoke. As the temperature drops in the evening the smoke comes down to ground level, reducing visibility and lowering the temperature in the town and its homes. “The only warmth is next to the fires,” Abdul says. 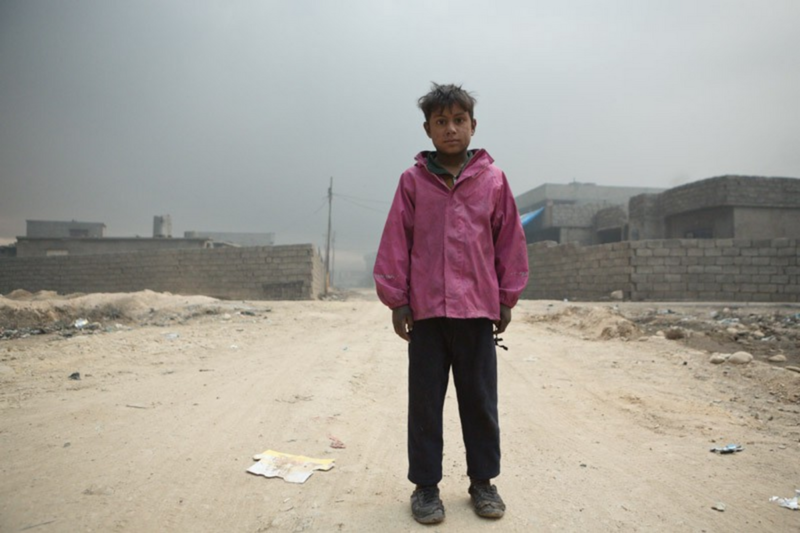 Abdul never left Qayyarah, even when the Islamic State started blowing up the oil facilities. “They said nothing to us, there was no warning,” he adds. When asked why he would stay in the town given the conditions, he replies that, like most, he has a large family and it would be difficult to move them all. Residents are now trying to pick up the pieces and carry on with their lives. Another man, Nabil, joins in. His eyes are red from the smoke. He has friends that have been to hospital for breathing problems, but he isn’t sure how many. “We worry about our kids. This has been going on for over two months,” Nabil says. 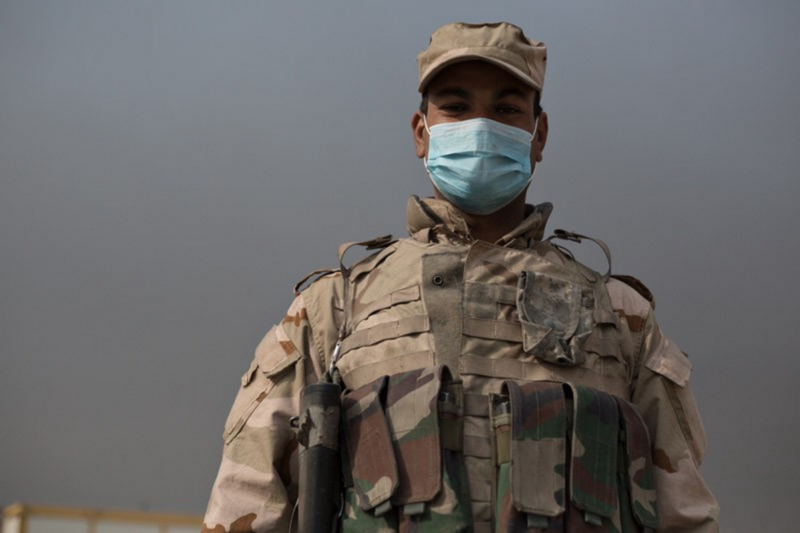 Although the main hospital in Qayyarah is a wreck after militants used it as a defensive position, Nabil says the small hospital which is currently taking the strain is doing well — and people know to go if they experience health problems. Both Abdul and Nabil share criticisms of the oil company’s work putting out the fires. “The men from the oil company get extra pay just for being here, but they don’t do anything,” Nabil says as Abdul nods in agreement. Opinions between the two differ on the exact reason for oil having contaminated the limited water supply. Abdul suggests that Islamic State militants added oil to the water on purpose, while Nabil says the militants broke the pipes and then oil got inside. Either way, the current state of the water is not in dispute. Abdul pulls out his smartphone and flicks through his pictures as the screen glows bright in the dull afternoon light. He settles on a photo showing a bucket of water with a heavy, oily film floating on the surface. Apparently the townspeople fixed the broken pipes, but it wasn’t enough. The smoke and the glow from the venting oil dominates the neighborhood. What’s left of vegetable garden shows that nothing can grow here. What were once plants have now been turned into lifeless sticks poking out of the blackened ground, with residual dirty brownish-green leaves. Even the furrows made by the garden’s owner have started to be filled in by the sooty deposits — smoothing everything over like a black snow. 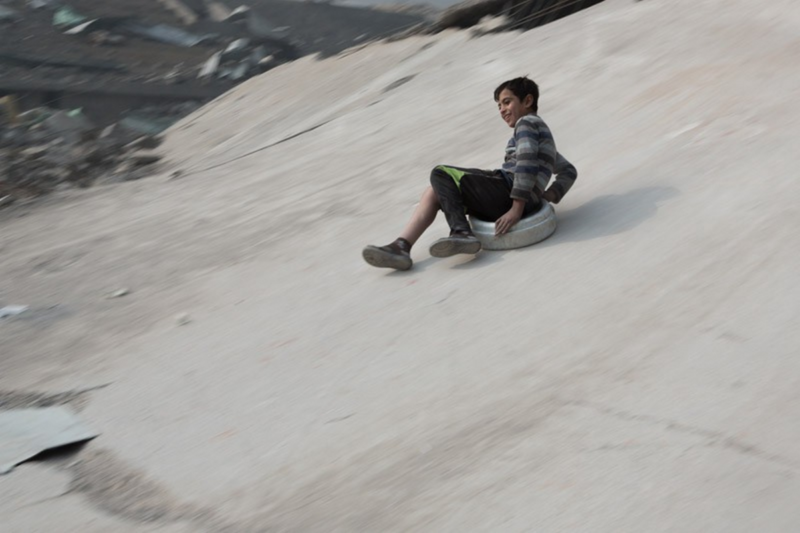 A young boy laughs as he jumps onto a large piece of plastic. Cheered on by friends, he slides down the concrete ramp before skidding to a halt in a cloud of dust. Other friends do the same, sledding down the angled structure on anything big enough to hold them. Two of the children straddle a large blue plastic chemical container, and when they stop, a boy in a dirty green jersey gets out. The three drag the drum to the top of the incline. Green jersey gets back inside and down they slide again, cheering as they go. The children are playing in what’s left of Qayyarah’s sports stadium, located at the southern entrance to the town right next to the main thoroughfare. The stadium is close to what was an Islamic State headquarters and within spitting distance of the Qayyarah oil plant. After the militants declared sports to be un-Islamic they partially demolished the stadium. Later, the militants used the sports field and its buildings as a meeting point and weapons storage, which meant the already damaged site was hit by at least two air strikes. The crater from one detonation dominates the dusty ground. It’s hard to imagine sports being played here. A group of young men are stacking and removing cinder blocks that have survived the attention of both the coalition and the Islamic State. Children are everywhere in the stadium, racing up the rubble-covered seating area, dodging pieces of metal reinforcement that poke from the partially demolished structure, while others carry on skidding down the collapsed roof. On the top of the seating area, one boy — slightly older than the rest and with a serious face — points out landmarks. “That was an ISIS headquarters,” he says, pointing to a pile of rubble behind a wall beyond the stadium. “Over there they [ISIS] executed lots of people,” he continues, pointing out parts of the town that were linked to the occupation. In the stadium itself, the Islamic State carried out punishments such as cutting off hands and executions — all part of the terror group’s skewed and draconian judicial system. The children here seem happy, finding things to do to amuse themselves in an environment that Western parents would balk at. Even the girls in the school, surrounded by concerned teachers, seem happy — despite many of them needing trips to the local hospital. Playing next to the fires and using parts of destroyed buildings for their own amusement is all par for the course in Qayyarah. But everything is carried out under a cloud that, until the fires are extinguished, will continue to rule the lives of the people in the town and could have dire effects on their future health.